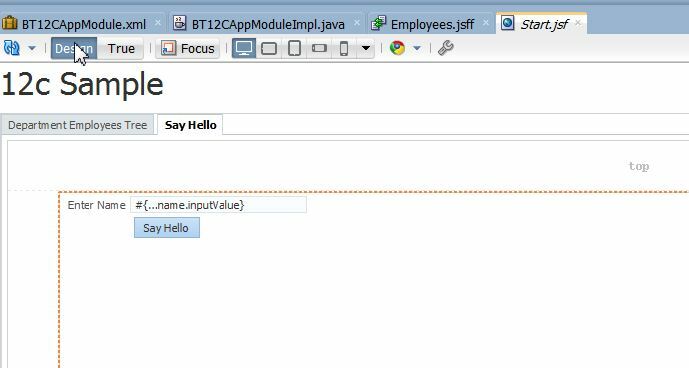 Over the last couple of days I took some time to check out some of the new features and changes in the UI of the new JDeveloper version 12.1.2.0.0 (aka JDev12c). My other post on this issue already mentioned some features. In my post Creating Variables and Attribute Bindings to Store Values Temporarily in the PageDef I showed how to setup page variables using the ‘variables’ iterator of the pageDef. There have been some change to the UI so that you can’t insert new variables via the pageDef editor (as it was in 11g). Variables are now added via the structure window only. I’m not sure if this is a bug or feature. 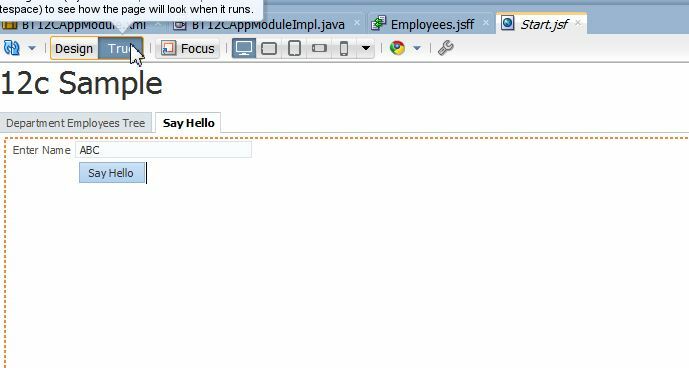 This is the feature you use to get help in the editor window when you hit ‘ctrl-space’ on Java code or a jsf tag. It shows you which methods (for java) or which properties (for tags) are available. You can open a ‘Documentation’ window which should get you the e.g. 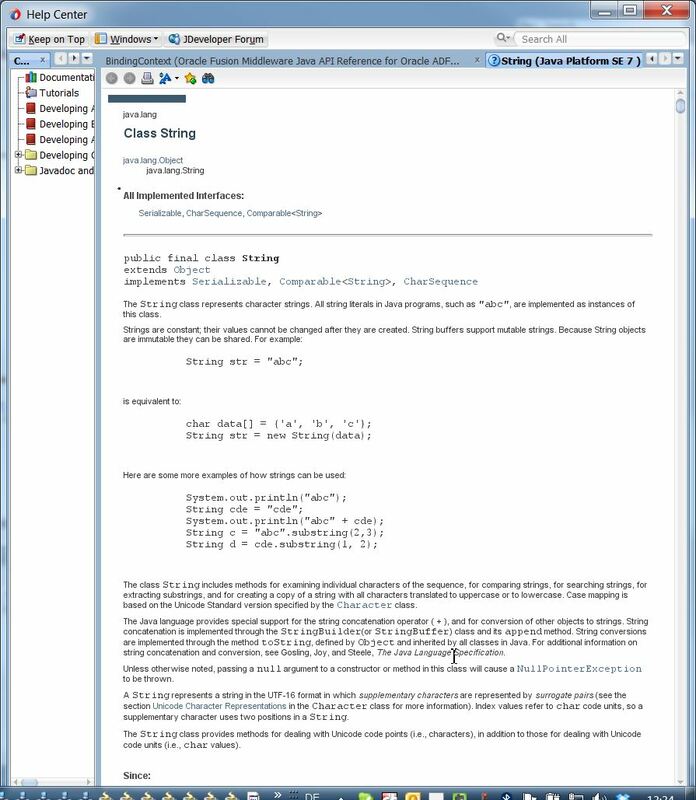 javadoc. It looks like this functionality does not work for ADF or Trinidad components at the moment. A new useful addition to the compilers errors and warnings are the ‘Live Issues’ in a tab you get when you compile or rebuild a project or class. This new tab allows you to quickly check audit rules and fix minor issues directly. but the added showDetailItem will not be able to retrieve the data. Instead you get an ‘Access denied’ message. Now you should be able to retrieve the data too. Look like hot deployment is working! Not sure what we see here, but it looks like a quick way to edit labels of components. As long as the label property of a component is empty or shows an EL you get this little window where you can select a text resource, enter an EL or enter static text. Once you have static text in the property you don’t get the window until you remove the static text. The Dependency Explorer allows you to quickly find where a component is used and how. This feature can be used e.g. to find out where a fragment is used. The design view now allows a quick switch into the so called ‘True Mode’. This display mode hides all visual help you normally get when you create a page or fragment. A visual help are e.g. the name and size of facets (e.g. of a panelStretchLayout). Turning this off give you a better feeling how the resulting page will look like in the browser. File Templates: Define custom file templates and invoke them from the gallery. You’ll find them in the Preferences under ‘File Templates’, but I couldn’t find any documentation about how to use them. If someone knows how to use them, drop me a note, please. 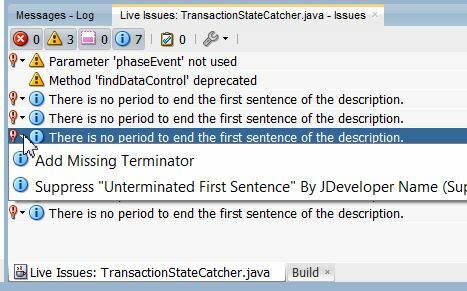 This concludes the findings on new or changes on JDev12c for now. I’m sure there are many more useful gem hidden and waiting to be discoverd. 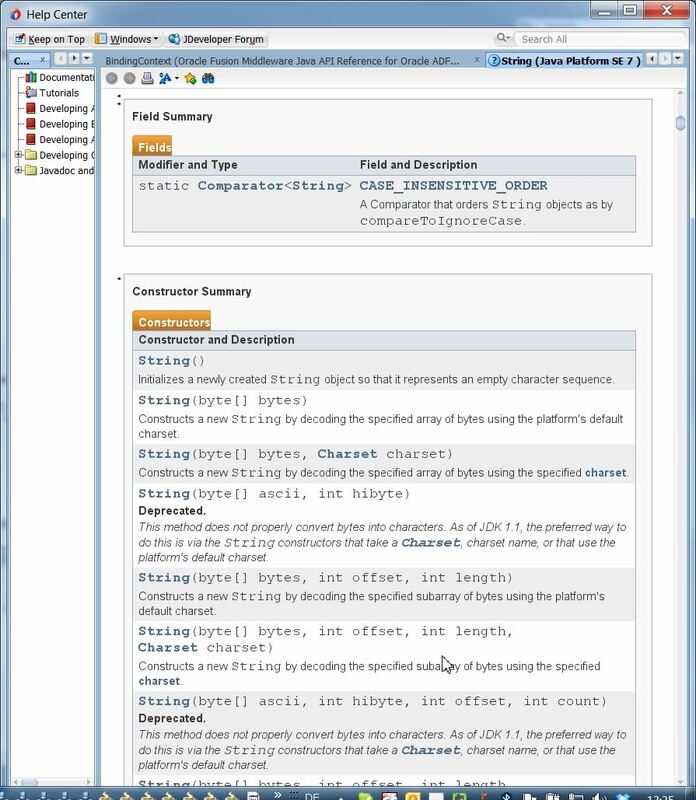 JDeveloper 12c has been made available today. As this is a major release it’s worth looking into the new feature list but I noticed some things we have ask for for a couple of month or years and which have been included in this version. Time to get something new to watch at! Fanzy new design with information on what is keeping JDev busy starting up. Well Done! I like the new icon, RIP old coffee cup. Yeah, JDev12c runs with JDK 1.7 under the hood! The installer does not have the latest 1.7.0_25 on board, but still it comes bundled with 1.7.0_15. The problems I had with 11.1.1.7.0 running on JDK 1.7 are fixed (at least I had no problems till now). By the way, if you run the generic installer you need to run it on JDK 1.7.0! If a task flow is based on a task-flow-template you had to know this (and the functionality) in the 11.1.1.x versions as there was no visual hint for this. JDev12c now shows the task flow template as gray shaded task flow. Good work! First thing one notice is that the menu structure has been changed. Sample: menu items to open ‘Database’ view, ‘Application Server’ view and many others are now moved from the ‘View’ menu to the ‘Window’ menu. The toolbars don’t contain all possible icons available, but now holds only the basic stuff. You can edit the toolbar like your are used to to in e.g. word (the old one!). What I have not found yet (and already missing it) is the ‘Ant’ icon which I used very often. As it takes time to check out all new stuff I’ll update this post in the next days with new findings. We waited long for the new major release of JDeveloper, finally it’s there JDeveloper 12c. It comes with an impressive long list of new features which takes some time to read and digest. The size of the installation package is huge (about 1.8 GB), so you have time to study the list of new features. You should watch the demos of 12c, which are impressive fast. Let’s hope they show real time starting of the new integrated WebLogic Server. 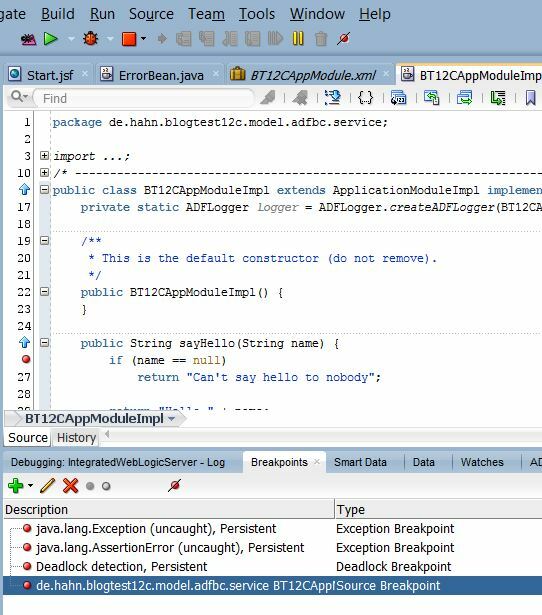 It’ll take some time to go through the new features, so stayed tuned for more about JDeveloper 12c!